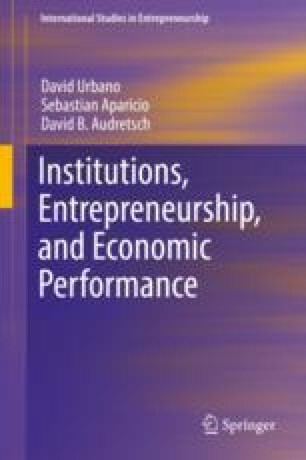 Focused on those consequences of entrepreneurial activity, this chapter estimates the effect of entrepreneurship on economic growth. To this purpose, our modeling relies on a traditional Cobb–Douglas production function, which allows the examination of possible factors such as entrepreneurship that may be also important to foster economic growth. A panel data model over 43 countries in the period from 2002 to 2012 is assessed. We find that entrepreneurial activity, approached through overall TEA, opportunity and necessity TEA, effectively influences economic growth, though overall and opportunity TEA have a higher effect than necessity driven entrepreneurship. Comparisons across countries and periods of time are also conducted. These analyses show that overall TEA seems to have a higher influence on economic growth of non-OECD countries than on their OECD counterpart. We also find that overall TEA has a higher effect on growth across countries during post-crisis period than during pre-crisis period. These results could be useful for both theoretical discussion and public strategy design, in which entrepreneurship may be considered a policy mechanism. Another version of this chapter has been published in Urbano, D., & Aparicio, S. (2016). Entrepreneurship capital types and economic growth: International evidence. Technological Forecasting and Social Change, 102, 34–44.